I'm currently sitting in my hotel room in Puerto Maldonado. I'm here a week earlier than planned due to a miners' protest that's been going on here. The region of Peru in which I'm staying (Madre de Dios) suffers from vast amounts of illegal gold mining. To combat this the government is going to put a cap on the amount of fuel people can buy without registering. Because the mining requires a lot of fuel, registering to get more would identify themselves as miners to the government. Since 28 March they have been protesting, and there was a truce over easter until 28 April so I had to get out while I can. They block the interoceanic highway which would have prevented me getting back to Puerto Maldonado from the airport, and they also occupy the towns; they've even been known to throw rocks at people out in public during the protest. I had 2 options, either get out now or have to wait until it finishes and as no-one knows when that be I took the first option. It's not all bad news though, as it means I can now go and spend 5 days photographing in the cloud forest where almost every species in front of my lens will be new, so I can't wait for that. This afternoon I'm flying to Cusco before getting a bus to my next destination on Sunday. I then have 5 days there before I fly back to London on 3 May, arriving on the 4th. I really loved it in the lowlands - as difficult as I found the photography there due to the low levels and high canopy, I can't wait to get back there as soon as I can. Here are a few photos that I've taken there so far. 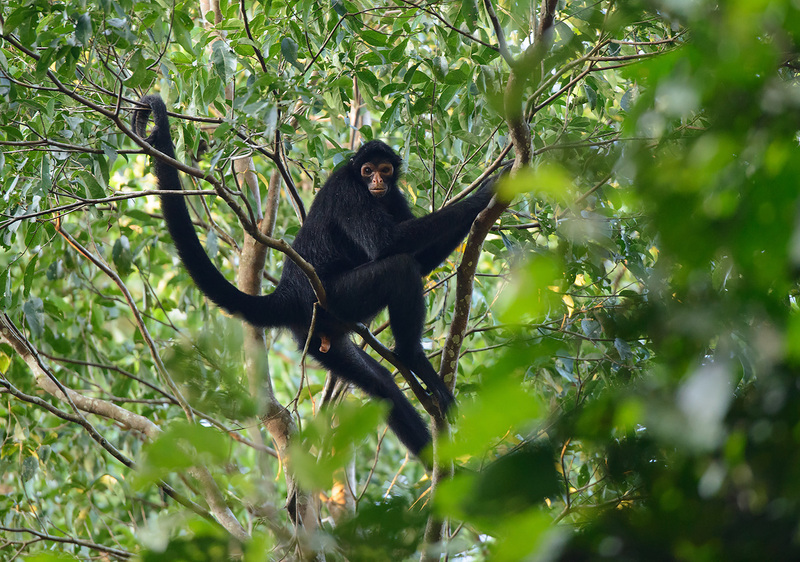 For a couple of weeks I spent most days down one particular trail near the river as pretty much every time I would see the same troops of Peruvian spider monkeys. On this occasion I just managed a photo before it disappeared. One evening while looking for the monkeys I saw this Spot-breasted Woodpecker to the side of the trail. Luckily it was nice and open so the light levels were much higher than normal, and most of the background was covered by trees, leaving no big white gaps in it! I also spent quite a bit of time up the 60m canopy tower. 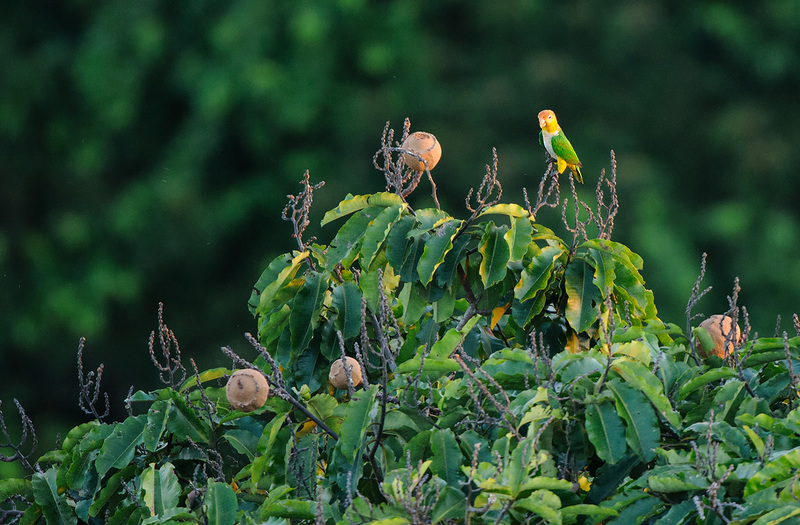 One evening a group of White-bellied Parrots flew into a castaña tree near the tower, just as the sun was about to dip below the horizon. It wasn't close enough to fill the frame so instead I decided to show some of the castañas on the tree. The colours looked great in the evening sun. 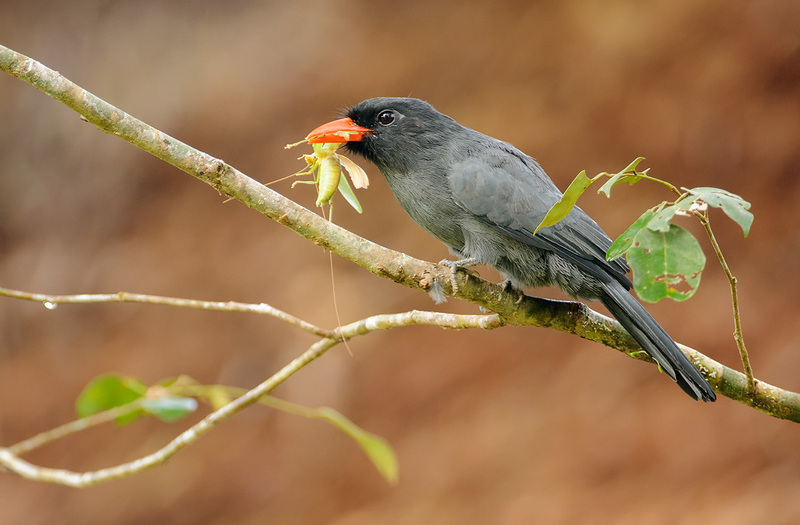 One of the birds I saw very frequently was this one, the Black-fronted Nunbird. They would perch up on fairly exposed branches before swooping down to the ground to catch caterpillars or, in this case, a katydid. 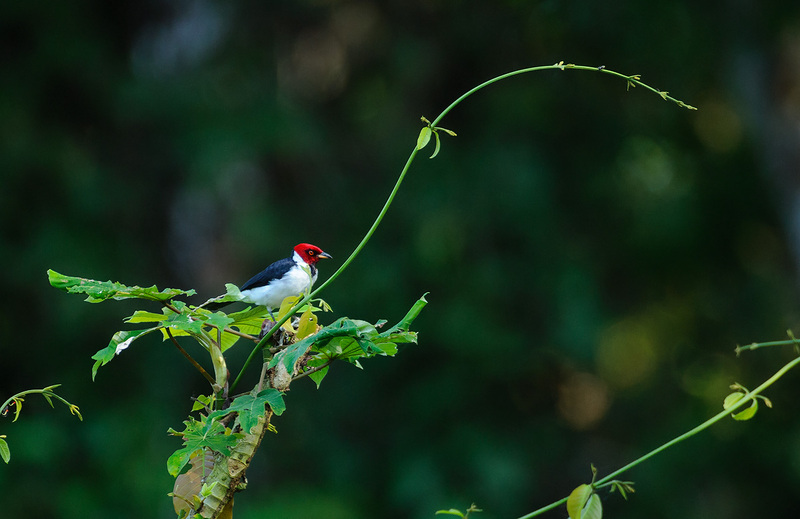 I also had a chance to go out on one of the oxbow lakes, where one of the most common birds was the Red-capped Cardinal with its crimson head. That's all for this post; I'll try and do another one within the next few days with some more pictures. Several organisations have helped me with my trip to Peru, through monetary or equipment support, so I'd just like to thank them. Firstly, I am very grateful to Mrs Lindsay Radermacher, who left a bequest to my school, St. Paul's, to be awarded to people on suitable projects and I was lucky enough to be a recipient of a grant to help fund my trip. The Jeremy Willson Charitable Trust have also given me a very generous grant. The trust's purpose is to allow Jeremy, a geologist who tragically died of Creutzfeldt-Jacob Disease in 2006, aged just 30, to continue to benefit people's lives. During his life he worked as a geologist for Shell, travelling to such countries as Nigeria, Pakistan and mountainous regions of Europe. He also spent time living in Indonesia, the Netherlands and the USA, and travelled to Torres del Paine National Park in Chilean Patagonia to undertake geological research expeditions. In addition to this he carried out independent field studies of the El Queva complex in the Andes in Northwest Argentina. With his twin brother he travelled through Costa Rica and Nicaragua in Central America, as well as Thailand. The trust now enables Jeremy to benefit people's lives through grants to people on projects involving Jeremy's passions: geology, adventure, the environment and athletics. Thanks must go to Swarovski Optik who have loaned me a pair of their EL 8x32 binoculars. 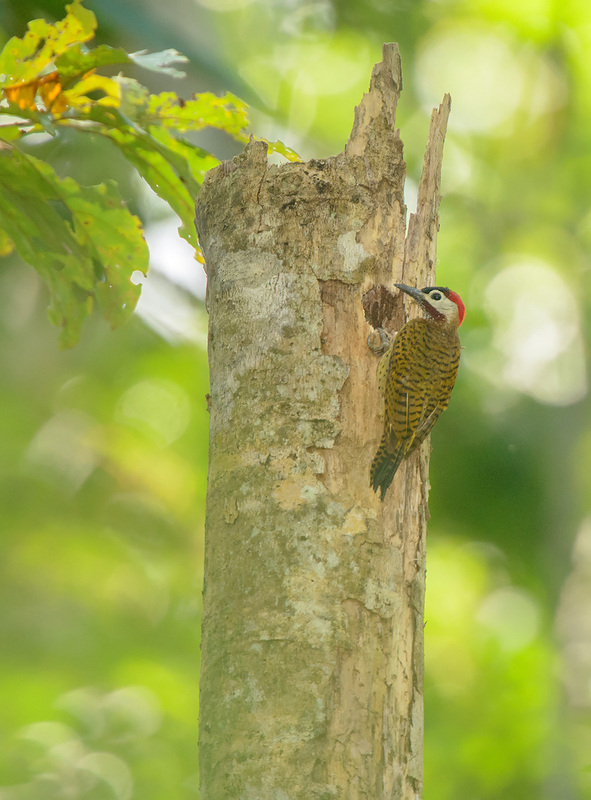 They are a joy to look through, and have proved invaluable for spotting birds in the darkness of the rainforest. Their small size and lightweightness makes them very easy to carry with a large camera over my shoulder. They've practically never left my side, but it's going to be hard to give them back afterwards though! Wimberley have also given me one of their flash brackets which as been very useful for telephoto work as it means you do not get the "steel eye" effect which otherwise occurs when the flash is attached directly to the camera. It's a must-have piece of equipment for long lens photography with a flash. 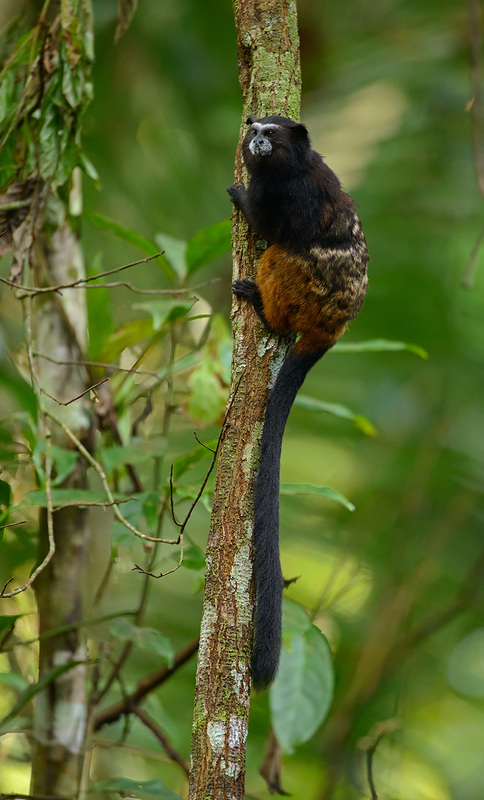 Of course I couldn't do a post without some pictures, so here's a Saddleback Tamarin I photographed along one of the more open trails last week while out looking for Peruvian Spider Monkeys. Peru 3 - Good news or bad news? I'm just over halfway through my stay in the Amazon, and given the events of yesterday thought I should do a blog post, so you can all experience what I'm going through. Bad news: My 600mm tried to escape into a lake yesterday. Good news: I saved it and it's dried out now and works. Bad news: In drying it out my camera broke. Good news: I have a back up camera (small consolation). Yesterday I went out on a boat on a small lake at the edge of a palm swamp. I had my D800 and 600mm on a tripod in front of me, nice and stable... At some point, however, I moved too suddenly and my lens made a sudden bid for freedom. Fortunately I was holding on to the tripod, so the lens never got more than halfway into the water, and I pulled it back out. Everything seemed to be working well (despite being very wet), but I left it out to dry. That afternoon all seemed well - camera could take pictures, and there was no water/condensation in the lens. To be safe it is now sitting in a dry bag with a load of silica gel to get all the moisture out. Unfortunately all was not as it seemed, as I discovered that afternoon. I had my 200-400 on and had come across a group of Peruvian Spider and Brown Capuchin Monkeys. Great, so I lifted my camera up and started shooting. Strangely enough, though, the AF was having great difficulty locking on, even to the simplest most contrasty subjects like a dark leaf against the sky. Something is definitely wrong with the electronics inside, so it's pretty much unusable for the rest of the trip. Thank god I brought a spare, because I was considering not doing. I think if I hadn't this post would be interspersed with some (read millions) of choice words which would have definitely (not) helped me feel much better. Anyway, I'm now left with 1 functioning camera, which is of course far better than 0, but worse than 2. I can't do anything about it though, so am going to have to make the most of it. I think the difference I'll notice most will be the ISO capability. 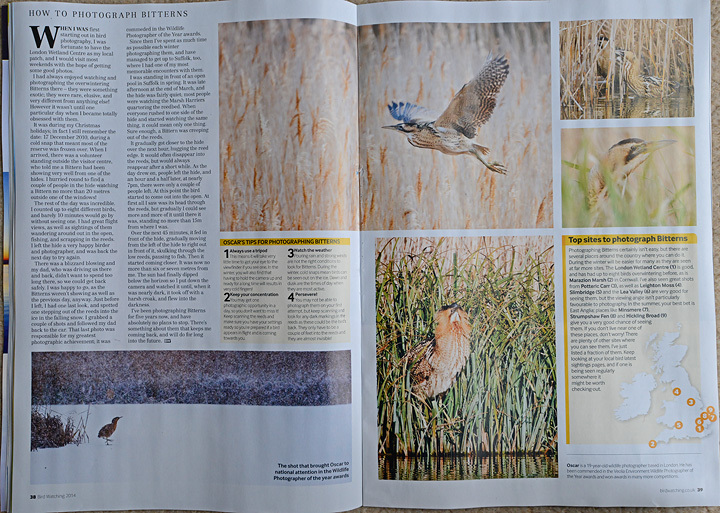 An awful lot of my shots so far have been taken between ISO 1000 and 1600...maybe time for some artful blur shots then! More good news: I had my first in print magazine cover this month! 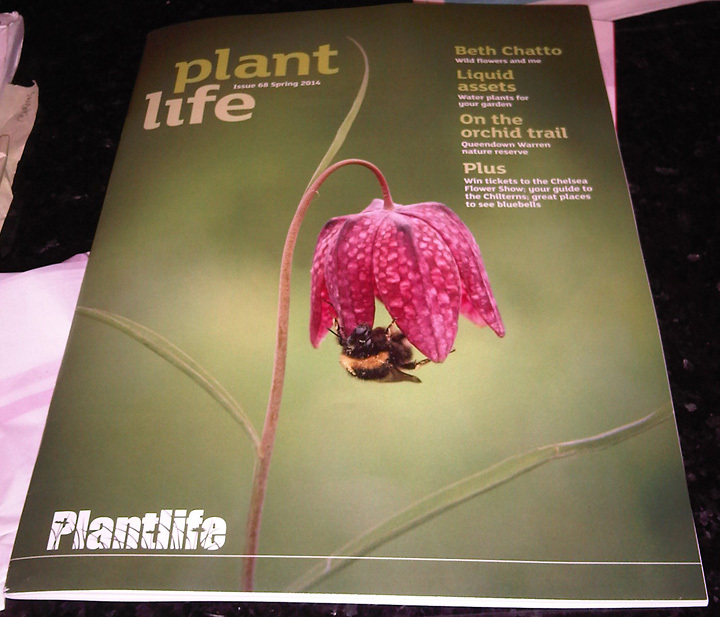 It's in Plantlife, and a picture of it is below, thanks to my dad for sending a photo of it to me. 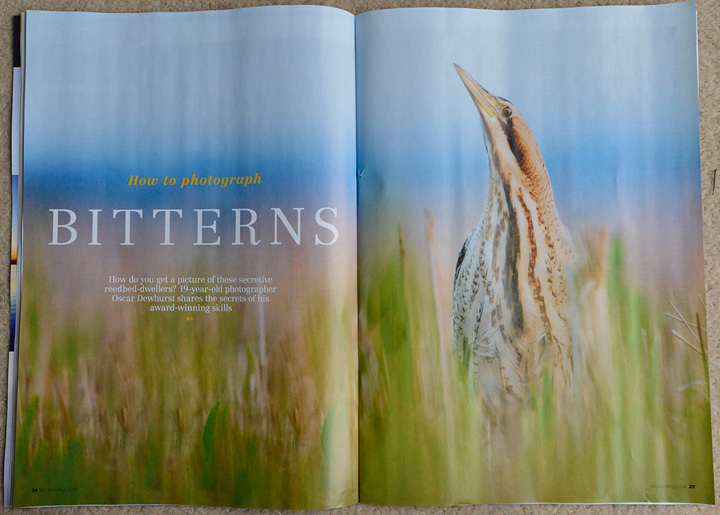 More more good news: Just before I left I also had 4 pages on Bitterns in Birdwatching Magazine! 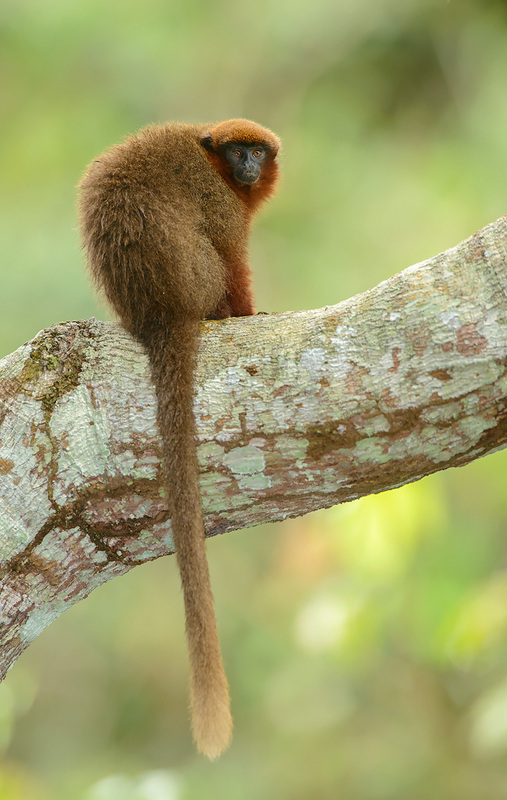 And here's a picture of a Dusky Titi monkey. These are fairly common here, and every morning about about 5.30 burst into life with an extremely untuneful racket. It's far better than hearing cars go past and jets flying overhead though, which is what I'll be back with on 4 May. I must admit I'm looking forward to it though - cool, not humid, and I will no longer be eating 3 meals of rice a day!